Do other wage series contradict the where’s-the-wage-response story? Nope. 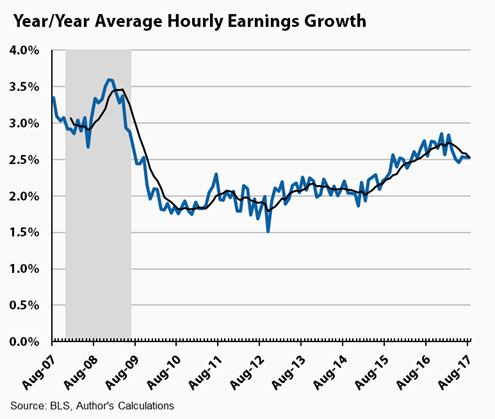 In a few pieces out this morning, I make some noise about how unresponsive wage growth has been to the tightening job market, using the wage data from the Establishment Survey, which covers the private sector workforce. This is the key figure, showing that while wage growth clearly accelerated from 2 to 2.5% as the job market tightened over the past few years, it has since stalled out. But do other wage and compensation series agree? 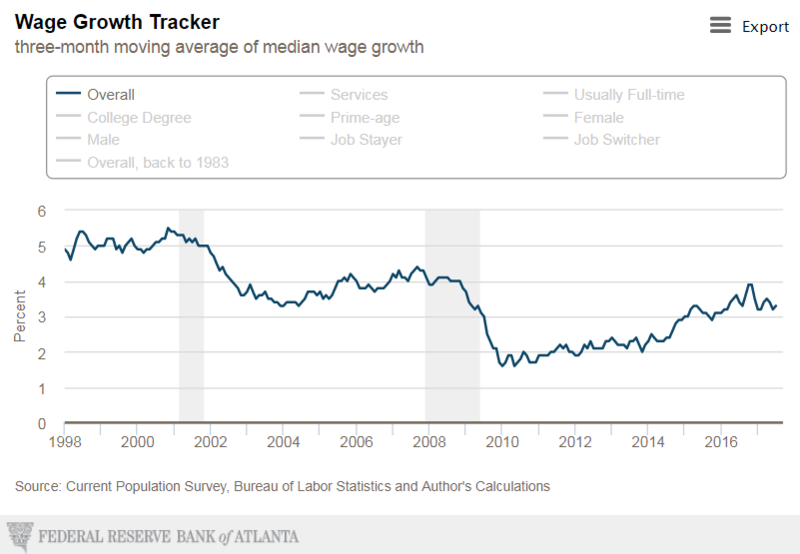 A lot of people like to cite the Atlanta Fed Wage Tracker. This series has some clear advantages, but I’m not quite sure what it’s telling me, as I’ll explain in a moment. At any rate, it too kind of shows some recent flattening, having sped up from about 2 to 3%, where it’s been wiggling around since about 2015. Most wage series compare snapshots across different time periods, but the Atlanta one measures the wage growth of the same workers over 12 months (really, workers employed in both time periods, e.g., this August and last August). Because of this, it will typically show more growth than other series, since it’s including an “experience premium,” the bump to wages some workers enjoy as they age (or, similarly, as they add another year of tenure at their job). Also, relative to the snapshots, it’s less moved-around by compositional or demographic changes. The unusual aspect of this wage series is that the median plotted above is not the median wage. It’s the median growth rate. They calculate the wage growth of people in the survey over the course of a year, and construct a distribution of growth rates from which they plot (a 3-mo. moving average of) the median. That means the median growth rate in any given month could be for low-, high-, or mid-wage workers. I find that a little confusing, as it doesn’t link to the earnings of what we typically think of as the median worker. 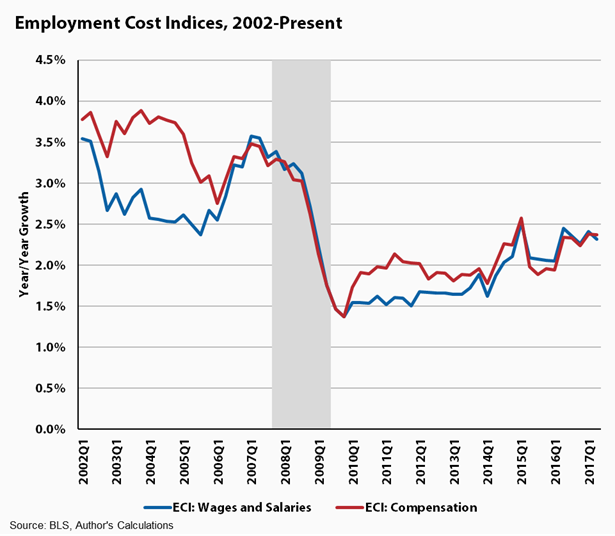 The next figure shows the yr/yr growth of the Employment Cost Index for compensation and wages. The ECI holds the industry and occupation mix constant and thus increases should not reflect changes in the shifting mix of jobs. It’s jumpy towards the end of the series, and there’s maybe a lift from around 2 to 2.5% growth. But, again, not much by way of acceleration. Finally, there’s our own mash-up series, the result of principal component analysis of five different series: compensation from the productivity and ECI data, ECI wages, median weekly earnings, and the production-worker wage from the Establishment Survey. It’s shown here with a 3-quarter rolling average to smooth out its bips and bops. It shows a slow acceleration from 1.5 to 2.5% (yr/yr), but like the others, probably not as much as you’d expect from an unemployment rate that’s come down from 10% at its peak to 4.4% last month. All the series show some responsiveness to the tighter job market, which is, of course, a positive development. That said, I don’t think the lack-of-wage-responsiveness story can be dismissed by referencing other wage and comp series. Share the post "Do other wage series contradict the where’s-the-wage-response story? Nope." 17 comments in reply to "Do other wage series contradict the where’s-the-wage-response story? Nope." I am curious what you think about the SanFran Fed’s recent commentary ascribing slow wage growth to higher paid late-career Boomers leaving the labor market and being replaced by younger, lower-paid early career employees. Dean Baker had something on this recently, and he was overly generous in his critique. Other comments pointed out even greater errors. Boomers didn’t stop booming (being born) until 1960 or 1961. Per BLS stats, possibly 1/3 to 1/4 retire before social security kicks at 100% when they turn 67 (in 2027). The yearly drop in older workers is on the order of 100,000 per year. It’s a 155 million workforce, so start with a maximum .23 effect if the third retiring early are replaced by workers making zero. That is not the case as everyone moves up a little quicker, and assuming they get the same job but are paid less, because they have a few years less experience, say 20 percent, we are now at .023 percent. This math is not difficult nor is the insight brilliant. It should worry you that the Fed can produce such crap. Please feel free to say if there’s an error in my reasoning. Boomers peaked in 1953 and were fading out by 1960. This post is another fail and you aren’t trying. Simply in that younger, cheaper cohorts are coming in as the older, expensive cohort is leaving. Baker wants to talk his book. Nothing more or less. You’ll need to check your sources of data or something. It’s understandable why you are wrong if you’re starting out with wrong assumptions and data. As late as 1964 births are still over 4 million. Your wasting time. Most of these indexes are useless and poorly constructed. 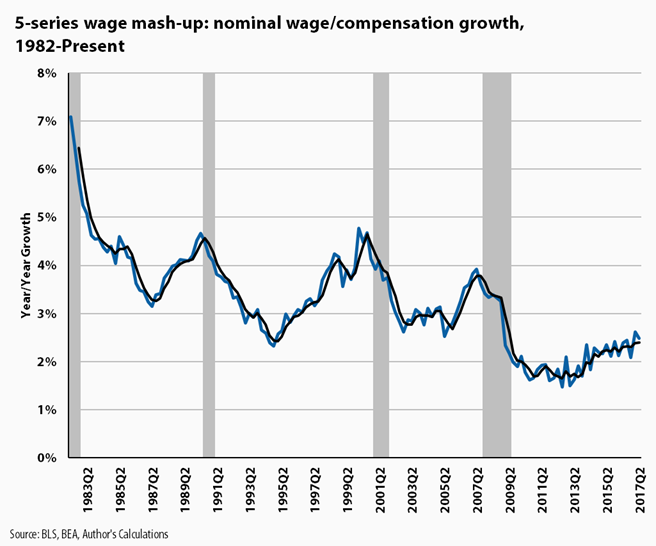 The nominal wage tracker index has been deflating since 1980. It was higher in the late 80’s than the late 90’s. yet the late 90’s had big real wage gains while the 80’s had losses. The US economy from 1975-95 was a real wage disaster. From 1995-present it has had real wage gains. Real wages are the only thing that matters. 2015 had massive gains in real wages that had been stolen by high oil prices of the early-mid 2010’s. Just how many times do I have to point out a million prime working age people (25 – 54) leaving the workforce since the recession or as recently as Dec 2011, would be expected to hold down wages? Added to unemployment they would give you 5% unemployment instead of 4.3%. Also, when will anyone acknowledge the over credentialed workforce holds down wages. Too many college graduates competing for not enough jobs requiring a degree holds down their wages. The surplus take positions not requiring a degree, crowding out an equal number without degrees, which tends to hold down the asking wage of jobs not requiring degrees. The total effect is to keep wages down for the entire job market in a way that an equal level of unemployment that didn’t contain an over educated workforce wouldn’t. When you get over the shock, hold my Nobel until I can go fund myself the airfare. Left the workforce? It is called retirement fool. Notice the totally flat prime age population ratios in the post-war era. It is nothing more than cohorts. The prime age EPOP began falling in 2001 when guess what, the Boomers began leaving that index that year. People leaving the workforce hit a all new high for the 50-55 Boomer cohort earlier this year as they retired. They are not coming back and losing those salaries and replacing them with cheaper, younger talent undercounts what raises are really happening inside the economy. Basing that on lazily constructed data is pathetic. Wrong, boomers add less than 12,500 additional retirements. Here is my data, sources, and fuller explanation to answer your ill considered objections. At 55, workforce participation has drops12.5% going from around 80% to 70%. The number of births decreased less than 100,000 per year until 1965. 12.5% * 100,000 means less than 12,500 out of 1 million could possibly be from retiring boomers. Additionally, I’m considering only prime age 25 to 54 year olds in the million missing, as this better reflects the state of labor conditions, vs early retirements or declining health of older population. Boomers boomed until around 1960. In 2000, the boomers turning 50 born in 1950 could number possibly 3.6 million (excluding deaths). 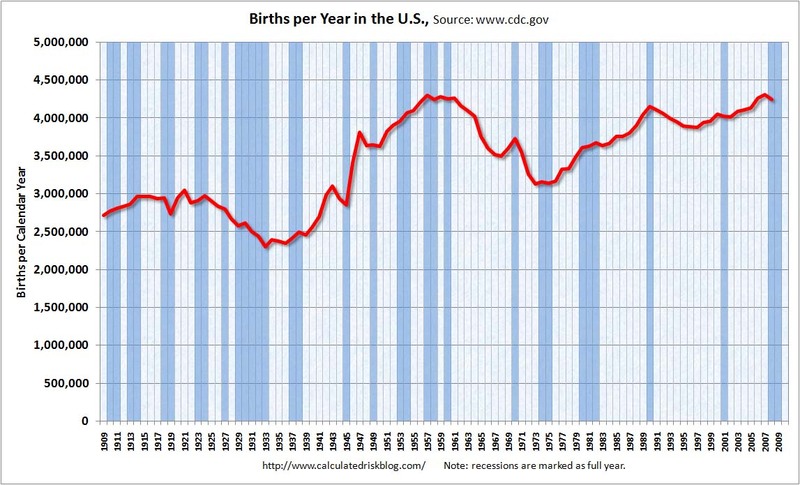 The number of births rose through the 1950s with a few fluctuations (minor dips) until reaching a peak of 4.3 million by 1959, where it more or less hovered for a few years before declining by less than 100,000 each year until a 1965 large drop of 270,000. But BLS shows the no more than a quarter workers retiring before 60 years, participation falls from 80 percent to 60 percent over ten year period, 55 – 59 year olds still around 70%. 270,000/4 = 90,000 retiring before 60, divided by 10 year period this happens = 9,000 per year additional workers leaving the workforce. A larger effect can be expected after 2025 when they reach 60. Peak boomers retiring before 60, generate numbers 1/3 smaller, and the effect is the same each year and not cumulative. They don’t reach 60 until 2020. This is where you get 1 million gone. While it’s possible an older worker is replaced with a younger one, usually, everyone in the food chain moves up a notch instead. The difference in wages is not between the youngest and oldest, but only the difference between the oldest and second oldest, plus the youngest and second youngest. There is no boomer story affecting wages. Also last paragraph on food chain effect is just to say the previous small effects cited are even smaller, the bigger story is the numbers of increased retirements are not large enough to affect wages. Mathematically, think about the fact that only a very small percentage leave the workforce for retirement each year. Then also baby boom effects are only from the difference from year to next of each cohort (that is one year’s births). Also to consider that peak boomers haven’t reached peak retirement age, they need to wait until 2026 for full social security for example. On top of that there is the food chain effect. There can’t be a significant effect on wages now. But the million missing are from prime age 25 to 54 year olds would be expected to affect wages if there absence is a sign of labor conditions and they appear to return to the job market as conditions improve. Real wages have been drained off additionally now by the magnitude of college loans and rising housing costs along with the precaution that follows for more than a generation after an economic emergency (what happened in the 1930s and now post-financial crises). But in a more globalized economy where lower wages can be obtained elsewhere much more easily now than in 1980, we still have a labor market biased against sellers of work/labor. Without much higher employment to population ratios in all population cohorts, the distorted control over the labor market will continue. Unless we have better economic policies … . But also keep in mind my future Nobel Prize winning theory of labor market segmentation. To summarize “Wages are sensitive to higher income market conditions.” Let me break it down for you. In the past, higher incomes demanded more training and lower supply of qualified labor pool created a greater premium. This was the classic gap between what a college degree would command and workers without that credential. Those with more formal education commanded higher salaries, faster wage growth, and lower unemployment. This is still true but the big deal today is that it is much less true. Why? What is the result? What is to be done? Why: Over educated workforce explains no pressure on wages for those with college degrees. What is the result: They still enjoy lower unemployment and higher wages because their excess labor supply is allowed, if not given preference into labor markets not requiring degrees. The opposite is verboten, excess construction, retail, and fast food workers are not accepted into office middle management and marketing positions, for the most part. Wage pressure is gone. Not only that, but although their income expectations and formal qualifications are higher, the surplus puts a downward pressure on all wages, both where they were (professional class), and where they settle (in lower paid sector). What is to be done: Obviously more jobs need to be created for the highly educated. Funding for research and development, and university research is historically low. This is very anti capitalist anti free market in that you are not allowing the market to dictate labor demand. However the entire education system, especially publicly funded expensive primary and secondary education already is a communist implementation, one of Karl Marx original ten points in the Communist Manifesto. Society also funds and underwrites college education, while it disallows bankruptcy for college debt. The dirty secret that the 1% don’t want you to know is we already have a mixed economy, part socialist, and part communist, but rigged to reward those at the top the most. We have a rich society. We can choose to create jobs for the occupations that people prefer, or we can allow the 1% to choose those jobs for us. The government merely needs to seed and steer the economy, it needn’t take over and rule. There is an implication regarding immigration too, there is no shortage of skilled workers, and programs that require employer sponsorship should be eliminated, and could be offset by increasing the diversity lottery. Only the elimination of employer sponsorship would allow immigrants to start businesses and create more jobs, instead of depressing wages and adding to unemployment as college educated surplus crowds out lower income workers. First, an aside, It seems that demographics need to be given more prominence in any consideration of unemployment or wages. If you are 16 to 24 years old the unemployment rate is 9% This young group represents 1/8 of the workforce, but a 1/4 of the unemployed. The data indicates their high unemployment is partly a symptom not a cause. Just as excess college educated crowd out those with less education, the youngest job seekers are competing with workers better educated and just a few years older. The amazing thing about this is the smallness of numbers a few percent makes the difference between recession and prosperity. Even in the great recession, 90% of the labor force remain employed. It’s a very selfish and stupid society that doesn’t address the problem adequately. This was written in 2011, yet instead of anyone discussing this issue, that there are already too many college graduates without enough jobs, we only get free college and more exploited immigrant labor tied to employer sponsorship, both of which make the condition worse. I favor free college and immigration without employer sponsorship (partly offset by increasing the diversity lottery), but the real issue is lack of jobs. It is not robots and not boomers retiring and not lack of skills. The Fed noticed this, EPI noticed it, even Krugman noticed. Evidently no one in the Democratic party did. And you wonder how Trump beat Clinton among white college graduates? By 4 points. By the way, as much as the Fed report and EPI report discuss the glut of college graduates causing stagnant wages, they still don’t quite get or describe how this creates a condition with very low unemployment 4.3% (or more realistically 5% if including the million missing prime age workers), and low wage growth. The point I’m trying to make is that a surplus of higher income labor is significantly and historically different from past surplus. The current 4.3% or 5% unemployment is very different from a previous equivalent levels. A surplus towards the top pushes everyone’s wages down, vs previously a shortfall pulled everyone’s wages up, even or especially when a surplus in lower levels meant overall unemployment measure was the same. It also gave opportunity to those in lower income groups and with less formal education to move up vs presently just the opposite. They are crowded out. I don’t have data to back this up presently, to prove that this is possible. Even if the data exists, it may be open to various interpretations. But the implication of the EPI and Fed reports, which seek to explain stagnant wages of college graduates and stagnant wage premium seems all but obvious. Wage growth is more sensitive to a higher income labor surplus than lower income labor surplus. The policy implication is that government policy needs to address the needs of an over educated workforce by steering the economy to create more high income jobs and investment. Current policy of expanding the surplus by promoting free public college for all (a laudable goal) and promoting greater immigration of college graduates (which both Trump and Democrats support) competing in a job market with already inadequate demand, will make the situation worse. It says wages appear stagnant because the new jobs that returning workers are now able to get pay crap. It also notes that during the recession the opposite effect made the economy appear less affected as low paying jobs disappeared and this helped productivity measurements too. https://www.bloomberg.com/news/articles/2017-08-14/fed-study-finds-wages-adjusted-for-baby-boomers-rising-just-fine Among other non nonsensical statements made is this one. 2017 – 65 = 1952. The baby boom expands until 1961. The workforce is currently getting older not younger. It gets younger when there are less old people. That won’t happen until 2028 or later. And when boomers do retire en mass, why wouldn’t a labor shortage raise wages? Also most older workers positions are not taken up by the youngest. That’s like Bill Gates retiring and Microsoft replaces him with an entry level programmer, vs everyone moves up the chain of command. But even in 2028, the numbers are too small to have a significant effect. The big drop in 1965 births of 270,000 is .17% of the 155 million labor force not including the growth until 2032 when this actually occurs, and they are replaced not by robots, not by people making zero, and not by entry level workers for the most part. Take an extreme case, 1941, 67 years later they retire in 2008. Twenty years later, more retire instead due to baby boom, it’s 2028, 1.2 million more, assuming zero growth in labor force next ten years. 1.2/ 155 = .008 or .8% if they’re replaced with workers making zero. They are not. Neither are they replaced with entry level workers. Also if the labor pool shrinks by 1 percent, why wouldn’t that boost wages thereby wholly negating any small demographic effect of even .3%? Ask yourself why our researchers making up stories like productivity and demographics to explain wage stagnation? Whether it’s purposeful deceit or rationalizing their world view, the information is a lie, a big one. An important one. People, you’re being duped. Wake up, people are reading this crap in Forbes and Bloomberg and it’s fake news. At least Baker calls them out on this, but only caught in New York Times. Also, yeah I’m not liking the personal attacks vs attacking arguments, either. One can only imagine what didn’t make it through moderation, considering the insulting language that still remains. It is labor day, and so to belabor the point, I saw elsewhere someone giving more refined figures, whereby baby boom retirements could hit 300,000 over the previous year in one year. That would still represent only .2 percent of the 150 million workforce. If their replacements got zero dollars, it hold back wages or wage increase by .2 percent. More likely everyone moves up the food chain, and perhaps the one year difference in experience allows a corporation to pocket 20 or 30 percent of that savings. I haven’t seen mention of self employment, small business owners, incorporated and unincorporated, and those who are likely pass through. More, less, too small a change to matter? Also changing (worse) behavior of C corporations, as businesses with over 500 employees which are invariable C employ 50 percent of the workforce.